Hostel Folks i Bratislava, Slovakia: Bestill nå! Hostel Folks offers its guests pure hostel atmosphere without compromising sleep quality. 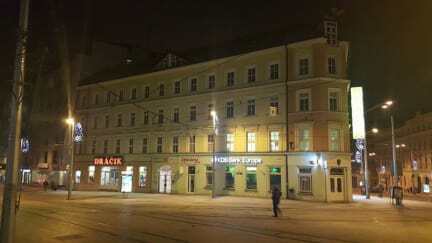 Thanks to the perfect location at the edge of down town pedestrian zone, our new hostel is the ideal base for sightseeing and exploring of Bratislava highlights. Enter its outstanding generous common spaces and enjoy cozy atmosphere of our guest rooms and dorms. St. Michael's Gate, located just across the street from our hostel, leads not only right into heart of historical centre, but also to the busiest district of Bratislava's nightlife. Prefer some venues of the beaten path? Most of them are not further than few hundred meters. We'll be glad to make your insight. 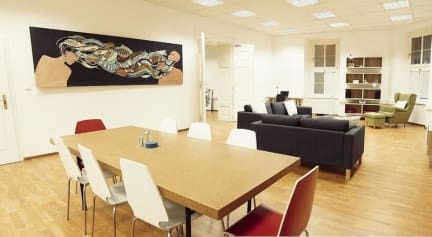 You can also profit from location near by Hodzovo Square, which is one of the main public transport hubs in Bratislava center and the ideal getaway for trips around the city. Whether you choose a private double, triple or quadruple room, or a bed in a 6-bed female dorm or 8-bed mixed dorm you can find fresh bed linen and functional yet elegant furniture. Socialize in the large common room with dining zone with free coffee & tea making facilities and lounge with large flat screen TV and PS 3 with selection of games for spontaneous tournaments. There is also a notebook with shared printer at your disposal. Our shared kitchen is equipped with everything you need to prepare your favorite meals while travelling. Whole property is covered with free Wi-Fi and most of the rooms are air-conditioned. Prices do not include city tax 1.70 EUR/ night. Students under 26, handicapped, retired and children under 15 are excluded from this liability. Please contact the hostel for reservations for groups of 7 or more members. All reservations over limit are subject of special policies communicated by hostel after booking. Property reserves the right to cancel any group reservations booked without previous agreement. The hostel was convenient to get to from the railway station by tram,and it is located in a nice building in the city centre. The staff is very nice and helpful. The kitchen is very small,while the common rooms by the reception are huge. There is coffee /tea with milk plus fruits for the guests in the common rooms. My door was paper thin so you will hear it as other guests walk by. Since there were shared bathrooms and kitchen,it was not always clean since not everyone cleans after themselves.